Today, I'm very pleased and excited to welcome début novelist, Kerry Hudson. 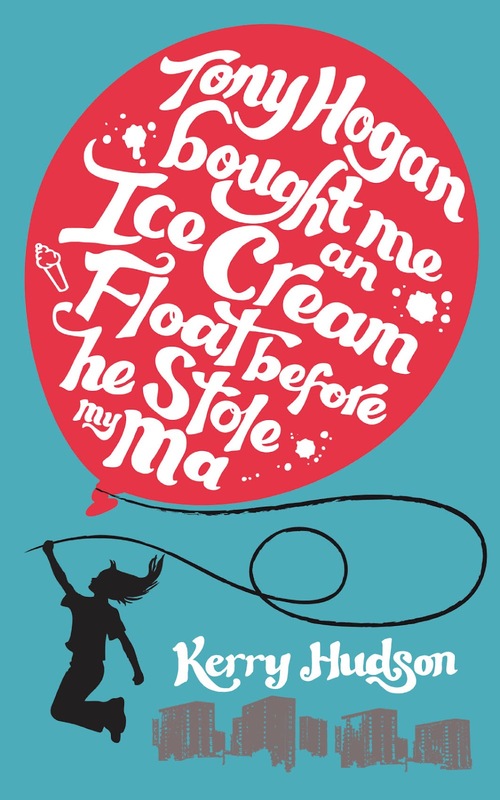 Her book, Tony Hogan Bought Me an Ice Cream Float Before He Stole My Ma, was launched on the 5th July and has already generated quite a buzz. Kerry has kindly stopped by Lies, Ink on her whistle-stop blog tour to answer a few questions, and give an insight into the book itself. But wait - That's not all! There is also a FANTASTIC and incredibly easy-to-enter competition that no writer harbouring dreams of following Kerry into the whirlwind that is the book publishing world would want to miss. More details at the end of this post. When Janie Ryan is born, she's just the latest in a long line of Ryan women, Aberdeen fishwives to the marrow, always ready to fight. Her violet-eyed Grandma had predicted she'd be sly, while blowing Benson and Hedges smoke rings over her Ma's swollen belly. In the hospital, her family approached her suspiciously, so close she could smell whether they'd had booze or food for breakfast. It was mostly booze. Tony Hogan tells the story of a Scottish childhood of filthy council flats and B&Bs, screeching women, feckless men, fags and booze and drugs, the dole queue and bread and marge sandwiches. It is also the story of an irresistible, irrepressible heroine, a dysfunctional family you can't help but adore, the absurdities of the eighties and the fierce bonds that tie people together no matter what. Told in an arrestingly original -- and cry-out-loud funny -- voice, it launches itself headlong into the middle of one of life's great fights, between the pull of the past and the freedom of the future. And Janie Ryan, born and bred for combat, is ready to win. I'm reading the book, although I'm only a few chapters in at the moment. I'm definitely enjoying it so far. 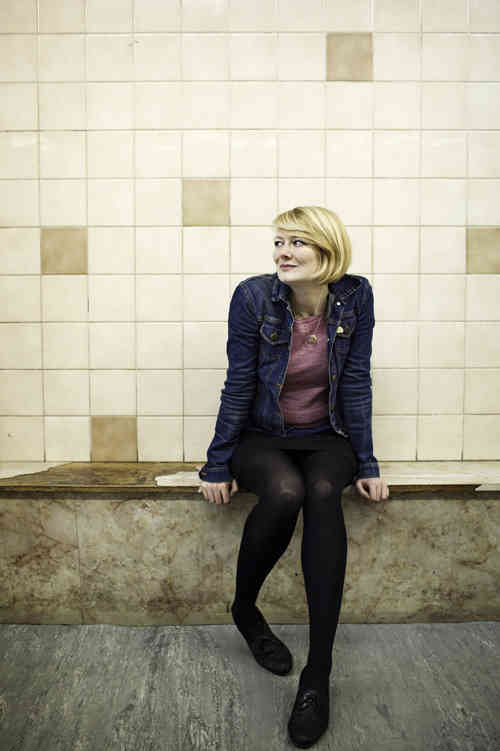 Janie is an engaging character and Kerry's writing is confident, fluid, and strikes the right balance between the grim surroundings of the characters and the humour that allows them to cope. So, a very warm welcome to the blog, Kerry. Now let the interrogation commence! Dan: I understand Janie's story began as a collection of short stories; what triggered the idea of reworking those into a novel and how did you find that process? Kerry: I always knew I'd attempt to write a novel one day but what triggered actually writing one was interest from my (now) literary agent. I sent her some stories and mentioned in the cover letter that I thought they might form the basis for a novel, she said she'd like to see that novel and so I wrote it! The process was so much easier than I'd imagined it would be because I'm actually a far more natural novelist than I am a short story writer. It's like wearing a shoe just a half size too small – you don't really realise there's anything wrong until you get the right size and then you're like 'ahh'. Besides, the novel spans sixteen years of Janie Ryan's life so I needed all of that space. D: In your Foyles interview, the question of class and labels came up. How do you feel about labels and being identified as a "working-class writer"? Do you think such labels help or hinder a writer in terms of generating interest and sales? K: Being a working-class writer (particularly a female one) has definitely generated some interest because there just aren't that many of us around and that makes people curious. How that affects sales I couldn't say as I suspect it's like any other label (socialite, academic, politician, philosopher, glamour model...) some people will respond to the idea and others won't. But I can't pretend that's not what I am and nor would I ever want to. D: What's been the biggest surprise for you so far on your way to publication? K: That people will get behind a début novel and that it's far less scary than I imagined. There may be some débuts who ride high on the excitement of being published for the first time but while I've had bursts of elation here and there I've mostly been walking the anxiety high wire. I was very nervous about the book coming out but people have taken the Ryan Women into their hearts and championed the book in such a wonderful and touching way. Quite a few people have been telling me they have given the book to their mums or daughters as soon as they've finished it – it's those moments that make the holy terror of it all absolutely worth it. D: Are there any characters in the book you wish you could have given more 'space' to / any you think you'll revisit at some point in the future? K: All of them! I'm desperate to pick up the story a few years later and see how Janie, Tiny, Iris and the rest of the Tony Hogan... gang are living their lives. There's also one character, who has a small part in Tony Hogan..., who gets a cameo in my second novel Thirst so I'm not done with them yet either. D: Are there any books that inspired or guided you as you wrote Tony Hogan? Either directly or just by being the 'type' of book you wanted to write? K: I've spoken a fair bit elsewhere about how I found it difficult to find books that represented the world I came from and which I then wrote about in Tony Hogan... but Roddy Doyle had always been one of my writing idols. Doyle is a writer who brings light and shade to rough situations, perfectly describes the love, energy and tenacity of people on less-salubrious streets and, for me at least, he brings tears and laughter in equal measure. I'd hope one day to be able to do the same and he definitely both influenced me and inspired me. I remember, very clearly, reading Paddy Clarke Ha Ha Ha as a teenager and seeing it had won a prize (I didn't understand what the Booker was then) and feeling like, maybe people like us do get to have a say after all. I'm so grateful to him for that. D: "Tony Hogan Bought Me an Ice Cream Float Before He Stole My Ma" will be followed by your second novel, "Thirst" - so you're going from one extreme to the other in terms of title length! What do you think makes a good title, and do you have any particular methods of finding titles for your work? K: Ha! Yes, I promise the one word title wasn't a reaction to always having to take a deep breath before reading my current title. I think titles just feel right or they don't. Thirst came pretty much instantaneously (though it's a working title and will probably change...) but Tony Hogan...is the third incarnation from 'The Dole Cheque Kid' to 'Echoes of Small Fires' and then to 'Tony Hogan...' I love the title though and long as it is it's perfect for the book. I guess it's like naming a child, you take your time because you don't want to be saddled with A Boy Named Sue scenario for the rest of your years. If any of you have an idea for the next incarnation of Thirst let me know! Thanks Kerry, I wish you all the best with the book. I'm sure it'll be a big success! 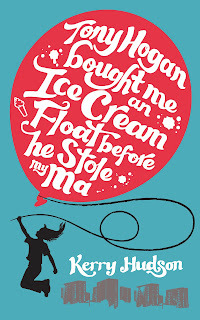 Tony Hogan Bought Me an Ice Cream Float Before He Stole My Ma is available from Amazon, Waterstones, and of course your local independent bookseller! The Tony Hogan Blog Tour continues, with a visit to Karen Clarke on Write Writing Written tomorrow. This prize draw is open to anyone who hosts or comments on a Tony Hogan post. There is no purchase necessary. There is no limit to how many times a name can be entered i.e. if you comment on three blogs you have three entries but it's only possible to win one prize per person. The winning names will be drawn at random on Wednesday 1st August and announced on my Tumblr blog and on Twitter. 1st prize - A three chapter or synopsis critique plus afternoon tea at Beas of Bloomsbury, London (at a mutually beneficial date and time) with Juliet Pickering from the AP Watt Literary Agency to discuss your critique. Plus a personalised copy of Tony Hogan Bought Me an Ice-Cream Float Before he Stole My Ma. 2nd prize - A literary hamper containing a personalised copy of Tony Hogan Bought Me an Ice-Cream Float Before He Stole My Ma as well as three of my most recommended writing theory books and Hotel Chocolat chocolates to enjoy while reading them. 3rd prize - A personalised copy of Tony Hogan Bought Me an Ice-Cream Float Before He Stole My Ma. I first read about Kerry's debut novel in the Herald newspaper then read a letter Kerry would've have written to her 17yr old self on Teresa Stanton's blog. Both features and this blog post made me book tickets to see Kerry at EIBF. I think the Tony Hogan book sounds brilliant- an authentic voice which I cannot wait to read! What I love about Kerry's blog tour is that at each stop there is a different slant. My copy arrived yeterday and I can't wait to dive in. The more I read about this book, the more I want to read it. That's really interesting about how it evolved from a series of short stories and the agent saying she wanted to read the novel. Helen - Yes, the letter on Teresa's blog is a really insightful, inspiring piece, isn't it? Rebecca - Kerry seems to have put a lot of effort into her blog tour. It's a pleasure to host this leg of it. Alison - I don't know how common it is for agents to even look at short stories. If I'd had a little more time I would have asked Kerry to expand on how that came about. It obviously worked out very well, though. I'm pleased to hear there may be a follow-up as I'm dying to know what happens to the characters next! It's so encouraging to hear a story of a writer "making it" (at least to first base!). I've never heard of a writer being noticed for short stories and asked to write a novel before - what a dream situation! Thanks, Karen and Chloe, for stopping by. Kerry was obviously very lucky (and talented), but it's inspiring to know that there are people out there, watching out for good writing and keen to give new writers a chance. Good luck with your novel, although I doubt you need it! Already intrigued by the title and it sounds like a really refreshingly different read. Thanks for posting the comp and lots of luck with the book. Really inspiring to hear more tales of a first time novelist and that it all started by submitting short stories. More of us should be so brave... Congratulations! Great title - hope it sells like hotcakes for you. I happened across this review by chance, but will definitely be making the acquaintance of the Ryan women in the near future. They sound a fascinating bunch! I love this book, so refreshing and well written. Well done and good luck with the next novel! Ooooooh, I was nearly to late for the comp! Thought I'd commented already, but it seems that getting married has been a bit of a distraction - there are quite a few things I meant to do but never actually did. The book sounds very interesting - and what a great prize! Kerry - firstly congratulations! Your book sounds excellent, and I love your bio. I also love - love! - the title, and totally agree that titles either feel right or they just don't. Yours feels perfect. Good luck with everything!